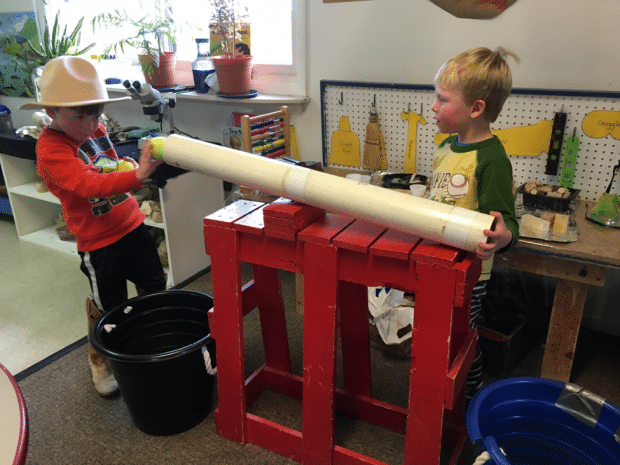 Everyday Play with The Ball Tube — a classic homemade toy! I wonder who in the 50-plus year history of our school made this “toy.” There are so many reasons this is the perfect play item for a preschool child. Children generally begin playing with this toy by putting a tennis ball into the high end of the tube and watching it come out the other end. But this is just the beginning! What happens when one bucket is empty of balls? What happens if a child covers the lower end with his/her hand and balls stack up inside? What happens if a child takes away the bucket that catches the balls? What happens when children slide a car, water, or sand down the tube? What happens when a child looks up through the tube and sees the eyes or hands of another child (generally this is cause for much laughter and surprise!)? What happens when children have differing ideas of what they want to do with the balls and buckets? This ball tube is an open-ended toy. It invites problem solving possibilities. It offers opportunities for exploration and experimentation. It offers opportunities for cooperation (yes, and conflict resolution) when two or more children are playing. It involves coordination and whole-body movement. There is no one “right way” to play with this toy. A very simple at-home version of this toy would be to provide a child/children with the a cylindrical tube, buckets and balls. 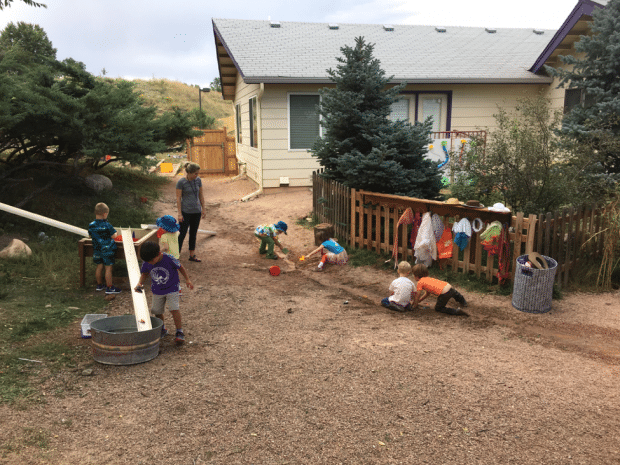 Long gutters purchased for the school by teacher Cecelia Lingle offer similar open-ended opportunities for experimental play. Children love these! I remember my own children playing (and learning) with the Ball Tube when they were students at Ruth Washburn in the 1990s. I marvel that children today continue to play creatively and joyfully with the very same Ball Tube. It is the perfect toy!